Tea time came to be in 1840 as a way to quell hunger between the two meals of the day. It was initially served around 3 to 4 in the afternoon. Supper was late. It was served with nice linens, pretty dishes and pots, sandwiches, scones, cookies, pastries, and Devonshire cream. I admit that my ultimate is to set up a true tea time and watch Victorian-type ghost movies. I get petit fours or slices of cake from the bakery at the grocery store to make the cakes easier. I prepare fancy sandwiches and my favorite tea - Earl Grey! I suggest movies like "Seance On a Wet Afternoon," "The Awakening," "The Woman In Black," "The Boy," "Bram Stokers Dracula," "Interview With the Vampire," "Sleepy Hollow," "Corpse Bride," "Brotherhood of the Wolf," "Wolfman," "Phantom of the Opera." Tea: Ideally, use spring or bottled water. Heat it to boiling. Use 1 tsp of tea per cup of water (tea cup size, not mug size) in an infuser or a tea pot with a strainer. Pour heated water over tea. Cover. Steep black tea 3-5 minutes, oolong 3-5 minutes, red/herb 5-7 minutes, green 1-3 minutes. Earl Grey: Smoky and fragrant with hints of citrus Earl Grey refers to any black tea with bergamot flavor added, but traditionally it is a blend of Indian and Ceylon teas. 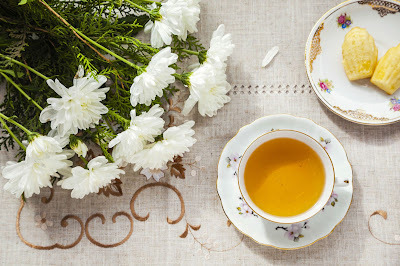 Earl Grey is one of the most popular of all the flavored teas in the world and is usually enjoyed with a slice of lemon and without milk or sugar. Bergamot is a citrus fruit, somewhat like a lemon, orange and grapefruit mixed together. Darjeeling: Darjeeling tea is produced only in the Darjeeling region of India, a high altitude region where there is a mist in the air almost constantly providing a cool and moist environment for the tea trees. This unique terrain produces tea leaves that have a very distinct flavor. The flavor is often described as muscatel, leading Darjeeling to be known as the champagne of teas. Darjeeling is a lighter than many black teas and has a fruity, nutty and floral palette. For this reason the English have considered it to be one of the best afternoon teas. Jasmine Tea: This is one of the most fragrant and flavorful of the tea blends and Jasmine tea is the most popular Chinese flavored tea. Jasmine tea is a special blend of high quality loose tea leaves with jasmine petals. The jasmine petals impart a delicate aroma and slightly sweet flavor to the tea. Jasmine tea is most often made using green tea but it can also be made using oolong, black or white tea leaves. Ceylon Breakfast: A blend of fine teas grown on the hillsides of Sri Lanka producing a rich golden liquor with superb flavor. Directions: Sift together the flour, salt and baking powder into a bowl and add the sugar and butter. Rub in the butter until the mixture resembles fine breadcrumbs. Gradually mix in the egg and milk mixture to make a dough, saving any excess to glaze the tops of the scones. Add your fruit at this stage if using. Gently knead the dough on a lightly floured work surface until smooth. Roll out the dough to about 1/2" thick, then cut out 2" rounds with a plain or fluted cutter, kneading and re-rolling the dough until it is all used up. Arrange scones on baking sheets then brush tops with the milk and egg mixture. Bake in the oven at 450°F for 10 to 15 minutes, until well risen and lightly golden. Cool on a wire rack. Whip the fresh cream until stiff. Split the scones and fill with butter, jam and fresh cream. Sandwiches: For the goat's cheese, walnut and roasted pepper sandwiches, mix together 200g soft goat’s cheese with 100g cream cheese. Spread most of the mixture over 5 slices white bread. Slice 2 roasted red peppers into strips, divide between the bread, then top each with another slice white bread. Trim the crusts, then cut each sandwich into 4 triangles. Whizz 25g walnuts until fine. Spread 1 edge of each sandwich with the remaining cheese mix, then dip into the chopped walnuts. 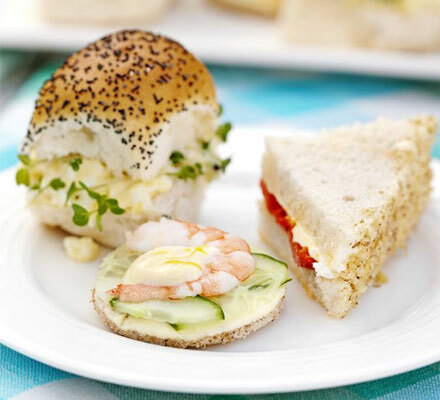 For the lemony cucumber and prawn sandwiches, lightly spread 6 slices wholemeal bread with butter. Cover with a layer of thinly sliced cucumber, then use a 5-6cm round cutter to stamp out 12 circles. Mix together 4 tbsp mayonnaise with zest 1 lemon. Top each circle with 1 halved large cooked prawn and a dollop of the lemony mayonnaise. For the creamy egg & cress sandwiches, boil 4 eggs for 8 mins. Cool the eggs, peel, mash, then mix with 2 chopped spring onions and 2-3 tbsp crème fraîche. Season, then spread over 12 small rolls. Add a little cress, pop on the lids and serve. Devonshire Cream: 3 oz cream cheese, 1 tablespoon white sugar, 1 pinch salt, 1 c. heavy cream. In a medium bowl, cream together cream cheese, sugar and salt. Beat in cream until stiff peaks form. Chill until serving. Pretty dishes can be found here. Wonderful teas can be found here. Book about vintage tea parties found here.